Lizards are reptiles of the order Squamata, normally possessing four legs, external ear openings and movable eyelids. Geckos are small to average sized lizards belonging to the family Gekkonidae which are found in warm climates throughout the world. 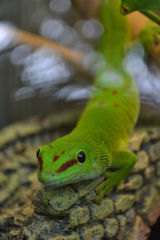 Geckos differ from other lizards in terms of their living conditions, physical charateristics and their eating habits. Have broad toes and big eye pupils and scaly skin. Have four legs, movable eyelids, scaly skin and are cold blooded. Like most reptiles, the majority of geckos lay eggs. The female house gecko lays four or five pairs of eggs between May and August, with two to four weeks between layings. Some lizards lay eggs in a nest. Others may give birth after hatching their eggs inside the body. Still other lizard species may give birth to live young. The female lizards do not care for their babies. Not venomous though of late some venomous varities have been discovered. Only two varities of lizards are known to be venomous. Geckos are unique among lizards in their vocalizations, making chirping sounds in social interactions with other geckos. There are 1,196 different species of geckos. The name stems from the Malay word gekoq, imitative of its cry. There are around 3800 species of Lizards in the world and over 110 of them are found in the US. Both the animals are four legged and cold blooded. Both have certain species that can change colors to camouflage. While most lizards have dry and scaly skin, the Gecko's skin is thin with small bumps on it. Lizards possess external ears and movable eyelids while Geckos have no eyelids but have a transparent membrane which they lick to clean. Night hunting Geckos have large pupils. While some species of Geckos may expel a foul spelling material and feces on to their aggressors in defense, lizards aren't known to do that. Some species of Geckos of specialised toe pads that enable them to climb vertical surfaces while Lizards aren't known to have them. 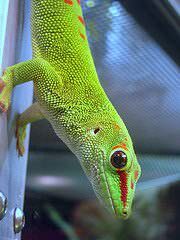 Most Geckos have broad toes covered with flaps of skin containing thousands of bristles and Lizards have clawed feet. Most Geckos can shed their tails and a new one can grow in its place, Lizards are also known to have a fragile, detachable tail. 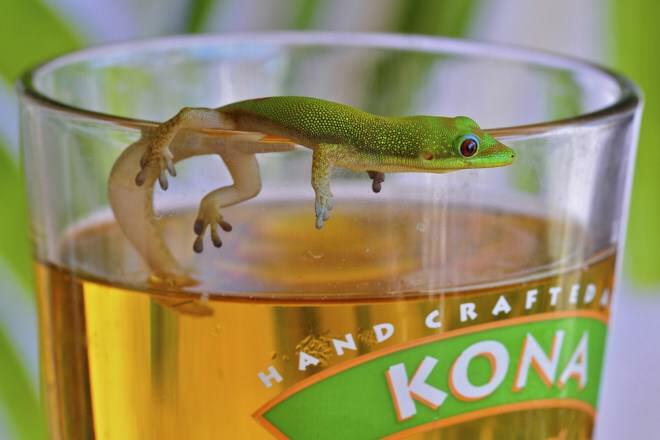 Geckos’ mating habits vary greatly. Like most reptiles, the majority of geckos lay eggs. The female house gecko lays four or five pairs of eggs between May and August, with two to four weeks between layings. Gecko egg shells tend to be soft at first but harden quickly. The female southern dwarf gecko has an unusual egg laying method. She strokes and pulls the eggs free with her hind legs. There are even species in New Zealand that bear live young. Geckos regularly shed their skin. This process starts shortly after they hatch. Lizards: Most lizards place their eggs in a nest. Other lizards do not lay their eggs, but give birth after hatching their eggs inside the body. Still other lizard species give birth to live young. The female lizards do not care for their babies. Most geckos hunt at night. The common gecko eats beetles, butterflies, millipedes, crickets, and cockroaches. Many larger species, such as the Caledonian gecko, pursue young lizards, mice, and small birds. Lizards feed on a wide variety of foods including fruits and vegetation, insects, small tetrapods, carrion, and even (in the cases of large predator lizards) large prey such as deer. The common gecko originated in North Africa and was carried unknowingly by humans to southern France, the Canary Islands, and even islands in the South Pacific. 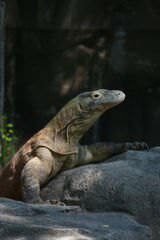 Lizards evolved over 200 million years ago when reptiles first evolved. 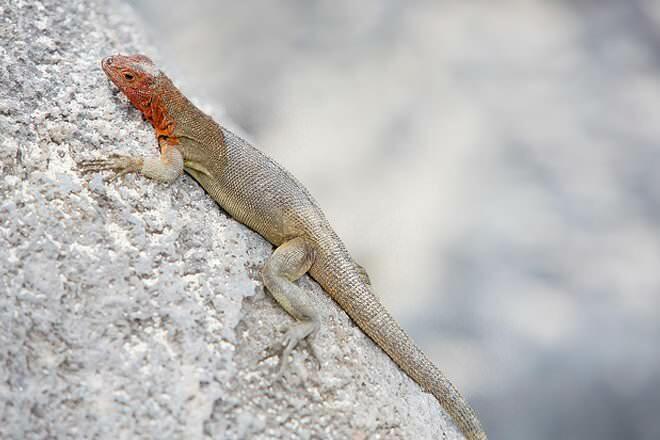 Species of lizards sold as pets include iguanas, bearded dragon, tegus, and monitor lizards. In general, lizards require more maintenance than other exotic pets. Leopard Geckos and the Crested Gecko are the most common types of Geckos kept as pets and feed on fruits and insects. While the average Lizard lives to about an year to three but they have known to survive decades as well. Geckos, on the other hand, live from 5-7 years on an average. The gecko Sphaerodactylus parthenopion is only one and a half inches long. It is the world’s smallest reptile. Sometimes a gecko’s tail heals instead of breaking off completely. A new one also grows in, leaving the animal with two or even three tails. A gecko pounces on an insect only if it moves. Sauropsida is not a class, it's a clade. Lizards are under the Reptilia class with the geckos. Where do you get your information? I breed Stenodactylus geckos and would question some of your so- called " facts"!